Geavis | What are the typical causes for anomalies in the overlap of aerial photo stereo pairs? In the photogrammetry for the creation of point clouds, digital 3D models and orthophoto maps stereo pairs of aerial photos are used. These are two aerial photos showing part of the same area and the coverage position is somewhat offset. The area that is overlapped for the forward should be between 60-70 %. It is used for the stereoscopic view and complete coverage of the area of interest. The area that is overlapped for the sidelap should be between 25-40 %. It is used to ensure that no area is left unphotographed. In an ideal case, an unmanned aircraft flies along straight and parallel lines in accordance with a flight plan. 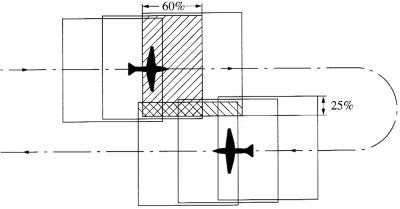 While in real circumstances, the aircraft (and camera within) direction and position can be disturbed by external factors causing anomalies in the overlapping of aerial photo pairs. When capturing aerial photos, we encounter two typical phenomena, which are the cause of the coverage errors. This is about Drift and Crab. Drift is the lateral shift or displacement of the aircraft from the planned flight lines that may be caused by the blowing wind or by the navigational errors. Drift may cause a serious gap between adjoining strips of photographs. Uncorrected drift results in subsequent photos covering more area in the prevailing wind direction. During side winds, if the pilot tries to maintain the original path, he has to turn the nose of the aircraft slightly against the wind. This makes the aircraft to rotate on its vertical axis. In this case, the original path is maintained, but the area covered by the aerial photo is much different from that planned originally. The photograph is rotated in the direction opposite to wind direction here. This defect is called as crab. Crab occurs when the aircraft is not oriented with flightline. It causes a reduction in a stereoscopic coverage of the terrain. It can be corrected by rotating the camera around the vertical axis. Drift is the result of not be able the unmanned aircraft to keep the planned navigation bearing. While crab is the result of being able to keep the planned navigation bearing but because of side winds, it doesn’t have an alignment yaw position with the bearing. Because of extensive crosswinds, there is a great possibility that we will have a combination of the two situations, drift, and crab. So it is said that it is good practice to capture aerial photos in calm weather conditions with as little wind as possible. In the case of excessive drift and, consequently, crab, it is often necessary to repeat aerial survey. In order to eliminate these problems, modern unmanned aircrafts are already equipped with appropriate technological solutions. Among them, 3-axis camera stabilizer or gimbal is very effective. It is an electronic system that stabilizes the camera with the aid of gyros and electric motors so that it always keeps its horizontal position and proper orientation despite the drift or crab of the aircraft.